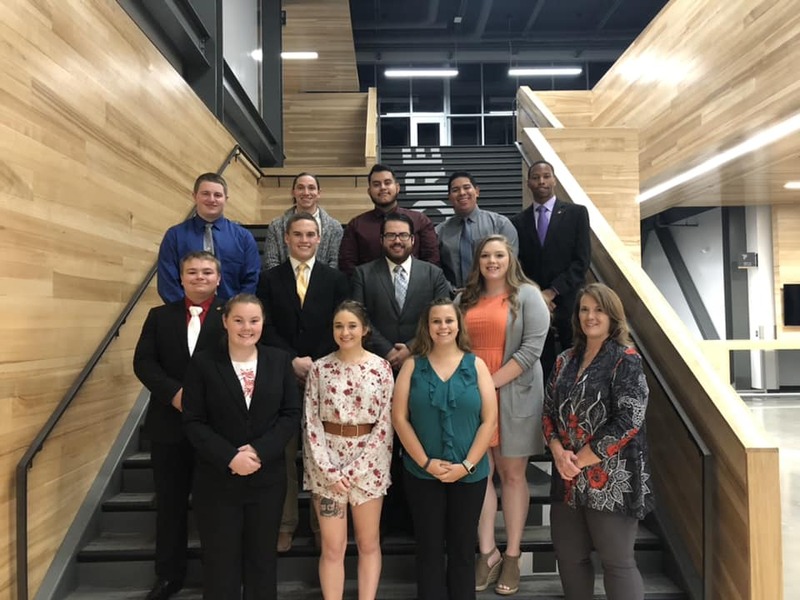 HAYS, Kan. – Criminal Justice Club members of the Delta Tau Omega Chapter at Fort Hays State University brought home three first-place awards at the recent criminal justice competition in Lee’s Summit, Mo. Roy Koech, Russell junior, received first place in the upper division of the Criminal Law category. Taylor Petersen, Phillipsburg sophomore, earned first place in the lower division of the Corrections category. Conrad Vajnar, Hays sophomore, received first place for the male under - 25 division in the Physical Agility category. The Region 3 Competition of the American Criminal Justice Association - Lambda Alpha Epsilon, hosted by the Gamma Epsilon Delta Chapter from the University of Central Missouri was at the Missouri Innovation Campus. “ACJA-LAE regional and national competitions allow students and professionals to compete in a variety of written and skills-based competitions,” said Dr. Tamara Lynn, assistant professor of criminal justice at FHSU. Written competitions include topics such as criminal law, police administration, corrections, juvenile justice and ACJA-LAE knowledge. Skills-based competitions include physical agility and firearms at both the individual and team levels. A skills-based team crime scene investigation competition was also included. All attendees competed in the written competitions. “In addition to competing, students have the opportunity to network with professionals across the criminal justice system,” said Lynn. “At the national competition, students also compete for scholarships and a paper competition. Other awards received are listed alphabetically by category. Petersen also received third place in the lower division and Lynn received third place in the professional division. In addition to Petersen’s first place award, Bea Walsh, Thornton, Colo., sophomore, received third place in the lower division and Lynn received third place in the professional division. The team of Tyler Beckman, Atwood freshman, Andrew Lankas, Atwood junior, and Lynn, received second place in the professional division. In addition to Vajnar’s first place finish, Walsh received second place for the female under - 25 division. Vajnar received third place in the lower division. Upper division represents undergraduate students who have successfully completed at least 70 credit hours. Lower division represents those who have completed at least 12 but less than 70 credit hours. The FHSU Delta Tau Omega chapter will host the region 3 competition in fall 2019.